It’s been another busy week but one filled with sunshine, fevers and plans. July is always a busy month for us...2 birthdays and an anniversary makes for a busy time. Add to this week a small child with illness (I am VERY thankful for calpol!) and the heat (I’m not really complaining but it makes it hard to sleep). So, joining in with Gillian, these are the things are the things that have been making me happy the last couple of weeks. I am also looking forward to my Learn to Crochet course in August. The ABO booked it for the same day as my friend, S, who is the brilliant knitter. 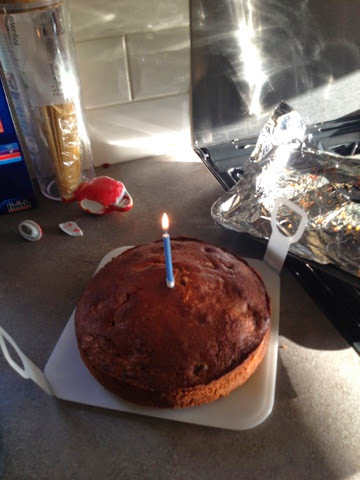 A James Martin Cherry cake no less. It was very good. The weather has been so good; I’ve spent quite a bit of time outside. There’s always something that could be done. I still have bedding plants to put in; I must’ve weeded the place they’re going to be planted at least 3 times but still no plants. Maybe if I wait long enough they’ll grow so big in their trays that they’ll plant themselves? LittleR cannot get enough being outside. Even if you’re just off to the bin she’s off to get her shoes and is bitterly disappointed when you come back in and shut the door. 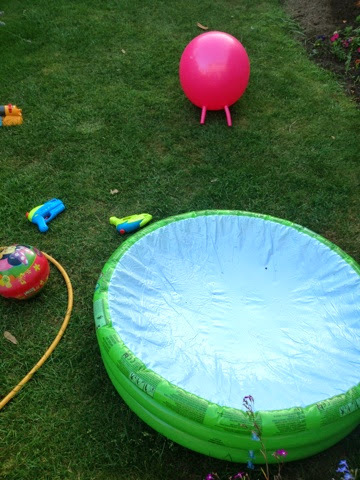 In honour of the ‘heatwave’ we bought a new paddling pool and with the sprinkler and some very cheap water pistols it’s provided a lot of entertainment for all of us. When I go out to water the plants in the early evening, I like to take in the remnants of the fun the garden held for us that day. I’m also excited to see that we have chillis! I’m not sure how long this one needs to ripen. 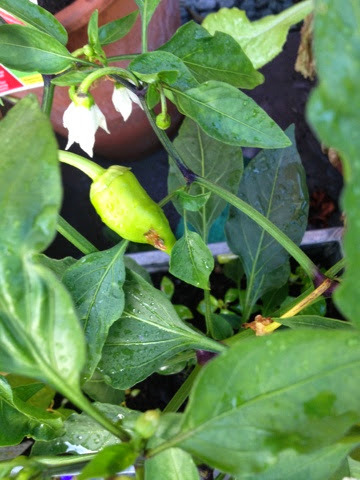 The little coloured card that came with the plant showed green yellow and red chillis on the plant. I guess if we hang on we might get a red (hotter?) chilli....we’ll see. I’m still a little sad that the blueberries are not yet ripe but I guess we have a few more weeks yet. I’m still guilty of trying to cram in too much during nap time. But this week I forgave myself. 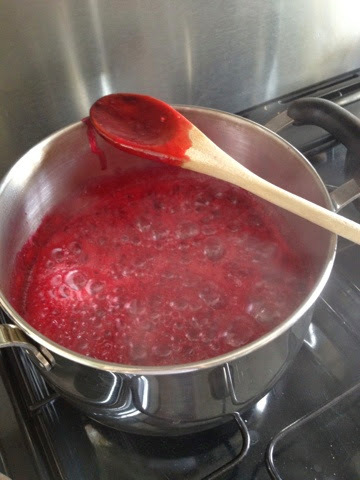 For the first time I made jam. Strawberry first and then raspberry. It took one evening and then one nap. I was amazed I didn’t ruin the saucepan. Then I was amazed it set. I did have a CJ style moment with a jar leaping from the fridge in a last minute burst for freedom a couple of days later. I did think about taking a photo but as the ABO had just mopped the floor I had to resort to stealth to clear up. It looks like jam. It even tastes like jam! A success, I will be doing it again. This goes back to the birthday presents but also noticing where I have been. 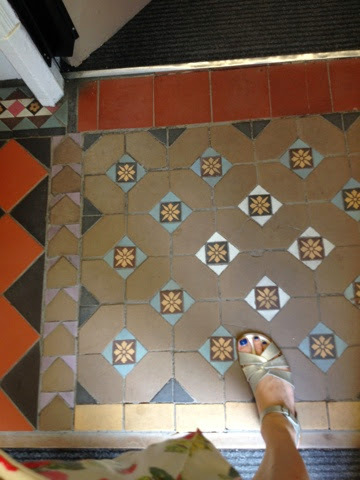 I love these tiles. I went to a meeting in the School of Education...some of the University buildings have beautiful original features (sadly not the building I work in which is a 70s monstrosity). And new nail polish. I love this turquoise colour. 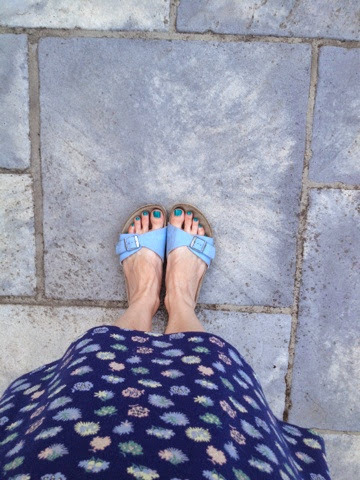 And seeing my new (home applied sadly, pedicures really are my guilty pleasure) pedicure in my exceptionally battered Birkenstocks in the garden. Thanks so much for all you comments recently...once again I will get round to answering and commenting on your blogs very soon. Oh, I wondered where the sandals came from - it seems they're quite The Thing in blogland and I fancy a pair for myself! Our university buildings were the same. I did live in an old (listed) one. It was lovely but incredibly draughty in winter with the high ceilings and rattling sash windows. Ironically the Architecture building was one of the ugliest on campus. I think it was built in the 1960s but I used to like going there on little errands - there was something a bit early James Bond about it! Have a lovely weekend and enjoy your garden. I'm just off to check the weather forecast! Gosh, I cannot tell you how often that has happened to us: planning some nice, just me-and-you outing and then one of us and/or one of the children is ill. Cramming things into nap time seems to be a habit most women just can't break. Having said that, the jam looks delicious. These are such wonderful happies. I really love your new Saltwaters, the color is so pretty. Happy birthday to the ABO, I hope he had a very nice day.